CUT 1 : a direct continuation of the acerbic exchanges of Waldo and Mark in Lydecker’s apartment. Mark pretends to be bored by his work : murders all look the same. Waldo argues that this one is exceptional. Mark refers to Laura as “a dame”. Conversation ends with a very short narration in which Waldo comments on Mark’s tough/smart personality which he thinks might have attracted Laura. Most of the material seems to have been ventilated in following scenes. Waldo’s comment will be – unfortunately for him – confirmed by Laura’s actual attraction to Mark, after her “resurrection”. Nothing indicates the scene was actually shot. CUT 2 : A slight shortening of Ann Treadwell’s interrogation. Mark asks whether Laura had enemies. Ann reiterates : “everyone adored her”. CUT 3 : Also Ann Treadwell’s salon. Waldo makes fun of Shelby’s so-called alibi and emphasizes on the fact that Mark suspects everyone present. No key info revealed there. That exchange may have been cut before shooting, to shorten a rather long expository scene. CUT 4 : This rather long scene (photo below) was the continuation of Ann’s interrogation. Mark, a fan of baseball, wouldn’t miss the Sunday event at The Yankee Stadium … and further opportunities to observe Waldo and question Shelby. The scene begins with Waldo’s very short voice-over mocking Shelby’s nervousness. 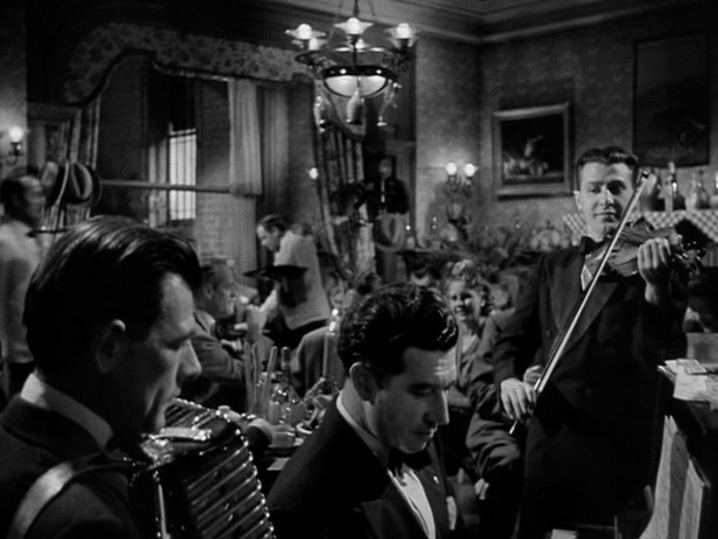 When asked what he did on Friday evening, Shelby tells Mark he went to a concert (Brahms’ First and Beethoven’s Ninth – indications which will be challenged in the next scene). Conversation then moves on to Shelby’s relations with Ann and the money she gave him. His justification that these were just loans is derided by Waldo, but a worse blow to Shelby’s dignity is inflicted by Mark : “She lied twice to you – by saying she was dining with Waldo and that she would then go to her country house”. Shelby remains speechless. 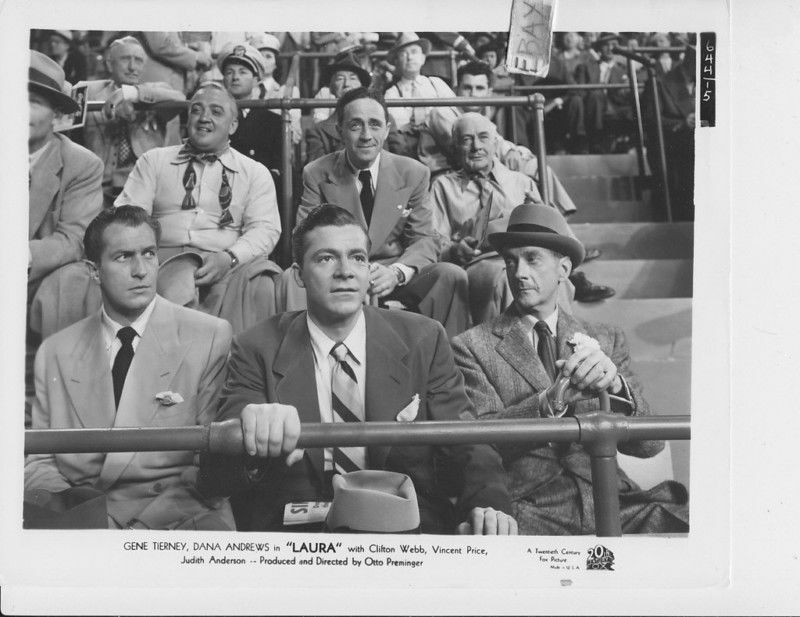 Outside the Stadium, he admits that he was the sole beneficiary of Laura’s life insurance. CUT 5 : Its setting : Montagnino’s, the small Italian restaurant where Waldo and Laura spent many enchanted evenings. That particular cut, to be observed on the adjoining screen shots, deserves precise description. 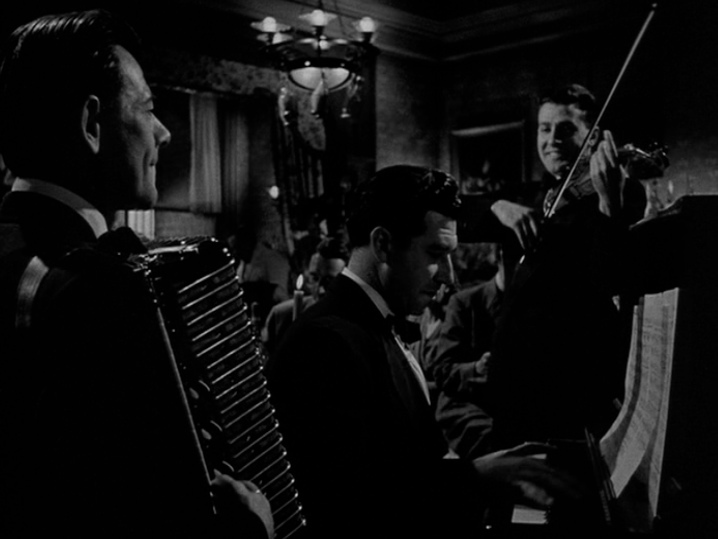 In the ACTUAL edit, the scene starts with a short PAN UP on three musicians playing Laura’s theme. Waldo is barely visible in the background, sitting ALONE at his usual table. The movement halts instantly, and the film abruptly cuts to a close shot of BOTH Waldo and Mark. The complete scenario I worked on included Waldo’s second great voice-over : a lyrical, nostalgic narration in which he amorously described his summertime dinners with Laura. At the end of this superb monologue, Mark would appear, ask to sit at Waldo’s table and listen to his story as we know it. We must assume that this cut was motivated by a desire to preserve the full impact of the next scene and montage. It has alas deprived us of one of the most beautiful narrations of the film. 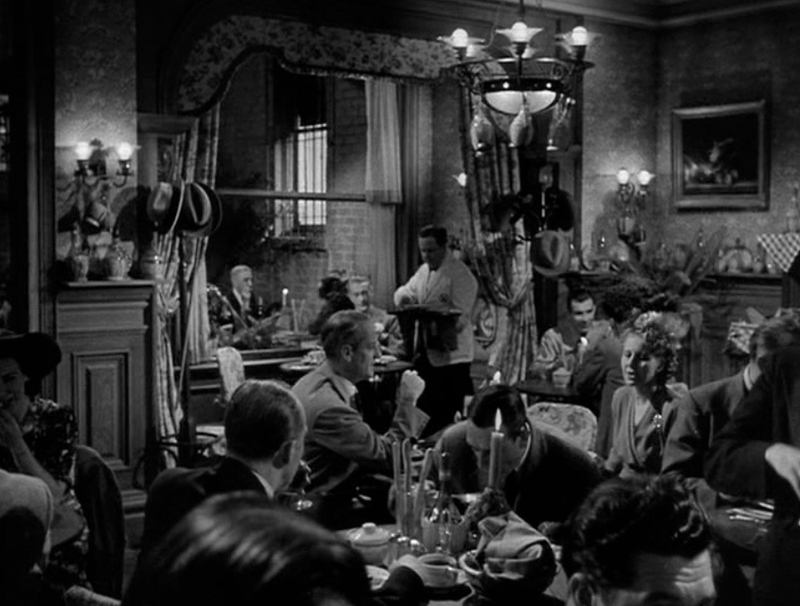 CUT 6 : The “ascent” of Laura would have included shots of such emblematic New York places as Sardi’s and the Stork Club. 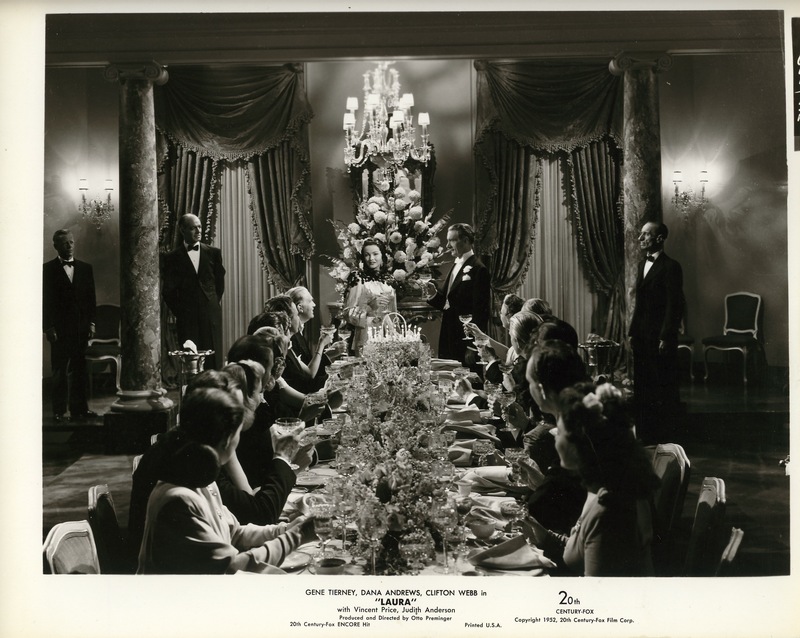 These were to be inserted between the brief, beautiful El Morocco shot and the longer dinner scene at Waldo’s. Cut 7 : Party at Ann Treadwell’s apartment. 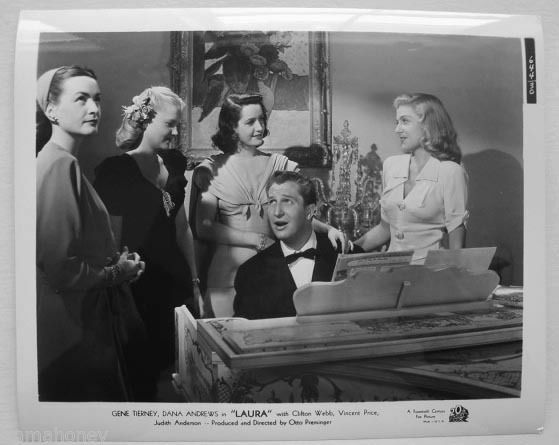 After the first of Shelby’s attempts to attract Laura’s attention, a rather long scene shows him at the piano singing for a group of entranced females asking for more. Laura comes by. Shelby asks her to choose the next song; she coldly rebuffs him, but he insists, humorously flaunting his numerous virtues… with no visible success. A shot of Shelby at the piano is included at the end of LAURA’S trailer. The dialogue of the NEXT scene where Shelby, again, tries to impress Laura in Ann’s kitchen is clearly a continuation of Shelby’s self-mocking praise – but it would have seemed repetitious. Cut 10 : After Ann and Shelby are caught in tête-à-tête, Waldo and Laura make a dignified exit. A) A single shot of them in a taxi would have followed, over Waldo’s narration, explaining how he tried to dissuade Laura from marrying Shelby. 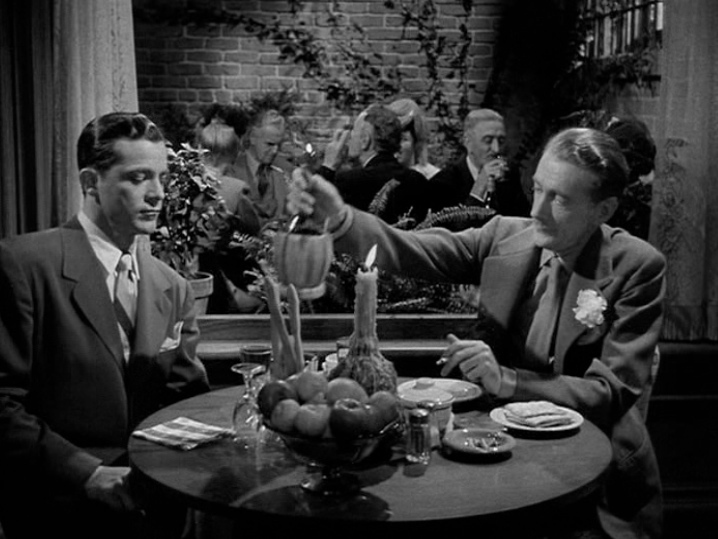 B) A brief return to the Italian restaurant Montagnino, with Waldo telling Mark he doesn’t know whether Shelby and Laura saw each other after that. Cut 11 : Mark and the Inspector (Cy Kendall, still credited, although his scenes were cut) discussing his inquest, in the latter’s office. The second part of the interrogation occurs then in the salon, with Laura in new dress. Cut 13 : Occurs after Mark announces he’s reuniting friends and colleagues of Laura in her salon. 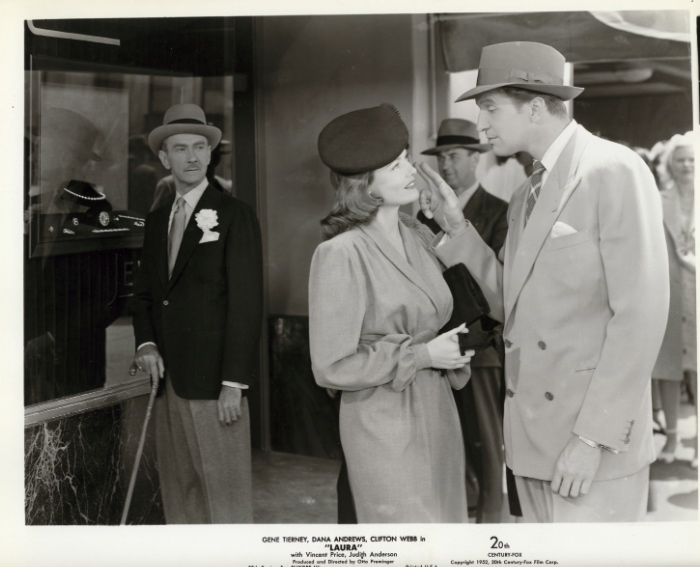 We see a group of about 30 people talking excitedly about Laura’s “resurrection”, among these her boss, Bullitt (Clyde Fillmore), who congratulates Laura and the antiquarian Lancaster Corey (Grant Mitchell) who has a few words with Mark. Due to this cut, Fillmore becomes a mere extra, and Mitchell is entirely eliminated, though both actors are still credited. Cut 14 : Occurs during that “general confrontation” in Laura’s salon. Having discussed Shelby with Ann, as well as her uncertain feelings for Mark, Laura reenters the salon. She tells Waldo that her fiancé seems to suspect her. The old mentor tries to comfort her… and to discourage her budding romance with the policeman. Mark barges in, as Waldo launches a full attack against a man “who wouldn’t hesitate to send a woman he loves to the electric chair”. He further reveals that Mark has tried to buy Laura’s portrait when he believed her DEAD. Cut 15 : This highly significant cut occurs in Laura’s apartment after Mark has explained the circumstances of Diane’s fortuitous murder. 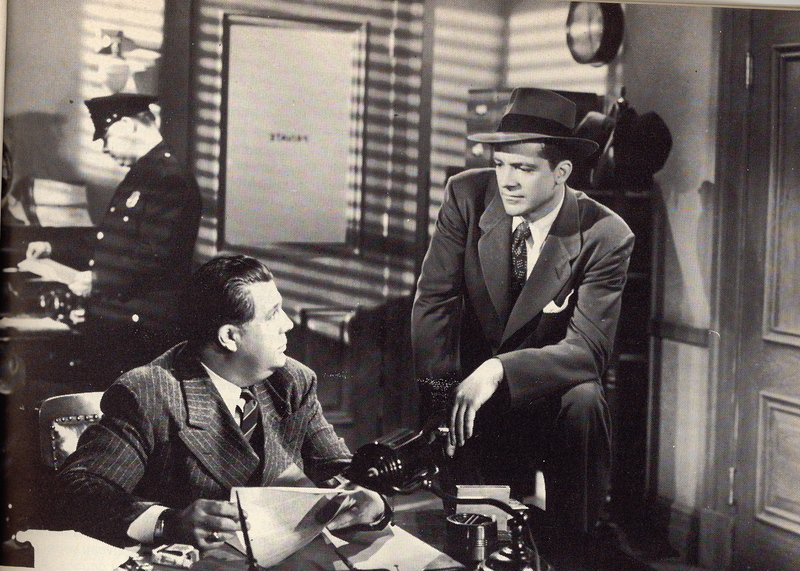 Laura tells Mark she is “as guilty as Waldo”, for not trying to prevent such a drama (I. e. by clarifying her relation to her obsessive mentor.) “But I owed him too much”, she says. You don’t owe him a thing. I owe him everything I am. He told you that story, too? You see, Mark, you simply don’t understand Waldo. He dramatizes everything. To him, I, like everything else, am only half real. The other half exists only in his own mind. The story he told you about the pen was one he had written for his column. Once he writes something, he believes it. Do you know where he actually first found me? In a night court. I had been picked up for vagrancy. Mark reacts as from a physical blow. Oh, I wasn’t guilty. It was just something that happens every day, I suppose. I came to New York, looking for a career. Highest honors in art school back home– the usual background. But I couldn’t get a start. One night I found myself locked out of my room. They picked me up on a bench in Central Park. She shakes her head unhappily at the memory. The judge wouldn’t believe my “hard luck story”. But Waldo believed me. He was in court, gathering material for his column. He came forward and paid my fine. Then he called Bullitt and Company, and got me a job. I went to work the same day. It isn’t easy to forget anything so wonderful as that. The scene goes on with Mark’s line: “I can understand that, Laura. But what I can’t understand is why you’ve tried so hard to protect Shelby these last few days?”, as it’s in the actual film. Two shots follow in the final edit : a) a rather disconcerting re-insertion of Waldo’s earlier shot, transfixed for MINUTES at the top of the stairs, then moving towards the service entrance, b) a shot of Mark entering frame from left, saying he understand Laura’s loyalty. Both shots seem slightly “awkward” – our intuition is that the CUT was indeed shot, and bridged as best as possible by the editor. This entry was posted in Uncategorized and tagged CUT SCENES, j, Jacques Lourcelles, LAURA (film), Laura Hunt, LAURA'S SCRIPT, Mark McPherson, Otto Preminger, Shelby Carpenter, WALDO, Waldo Lydecker. Hi, is there ANY way to read/get/buy the Laura screenplay- in any format? Thx, Jill. Hi, Jill. Thanks for your request. The only version i’m aware of is the french translation I worked on for L’Avant-Scène’s special Preminger issue. I guess it’s still available on ebay or Amazon France. Is there any way to read the lost voiceover of Waldo’s? Just found a copy of the shooting script online. Thanks for a great post! Congratulations! Are you now looking for the lost Waldo narration which started the scene at the italian restaurant between Mark McPherson and Waldo. Does your copy of the script include that? The one one I used came from Preminger’s own archives.